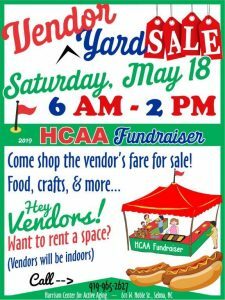 Come to the HCAA Vendor and Yard Sale Fundraiser. Proceeds will benefit the Harrison Center for Active Aging. All vendors will be inside at the Gymnasium. If you’d like to rent a booth, contact us!